Orpheus was the son of the Greek God Apollo and the Muse Calliope. He was presented by his father with a Lyre and taught to play upon it, which he did to such perfection that nothing could withstand the charm of his music. Not only his fellow-mortals but wild beasts were softened by his strains, and gathering round him laid by their fierceness, and stood entranced with his songs. Orpheus fell in love with a beautiful nymph named Eurydice. 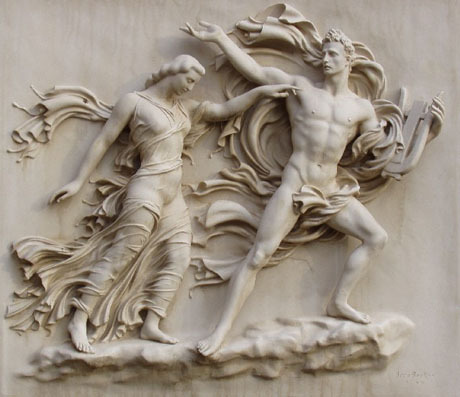 Hymen, the God of marriage ceremonies, had been called to bless with his presence the nuptials of Orpheus with Eurydice; but while he attended, he brought no happy omens with him. His very torch smoked and brought tears into their eyes. 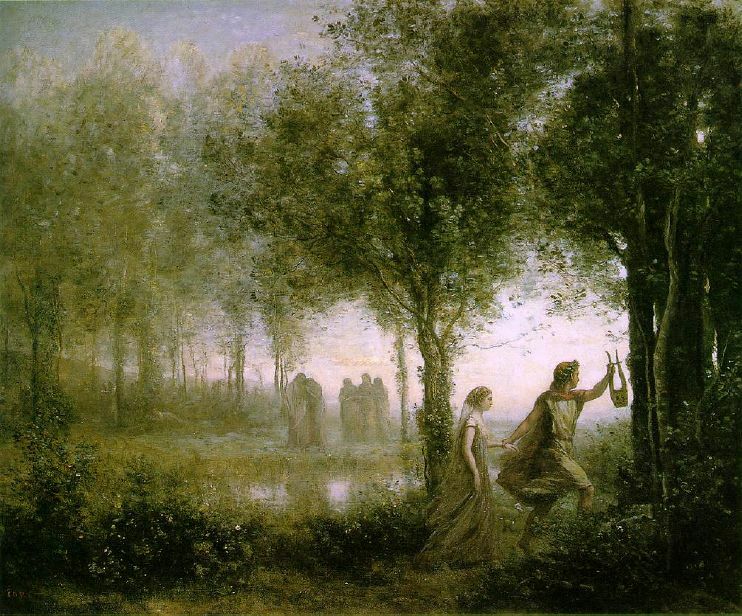 Shortly after her marriage, while wandering with the nymphs, her companions, Eurydice was seen by the shepherd Aristaeus, who was struck with her beauty and made advances to her. She fled, and in flying trod upon a snake in the grass, was bitten in the foot, and died. Orpheus sang his grief to all who breathed the upper air, both gods and men, and finding it all unavailing resolved to seek his wife in the regions of the dead. He descended into the Underworld, passing through crowds of ghosts, and presented himself before the throne of Hades and Persephone. 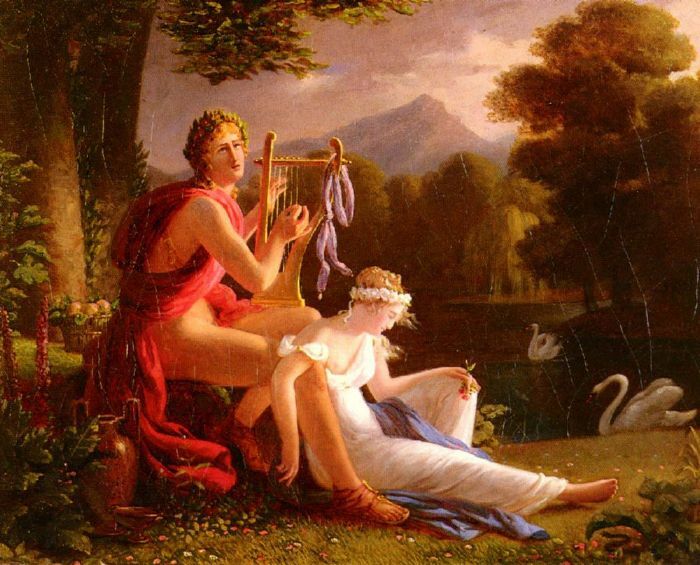 Accompanying his words with the lyre, he sang of his love for Eurydice and of her untimely end. He sang that Love (Eros), had led him there, Love, a god all powerful with us who dwell on the earth, and, if old traditions say true, not less so here. He implored Hades to return Eurydice to him. "We all are destined to you, and sooner or later must pass to your domain. She too, when she shall have filled her term of life, will rightly be yours. But till then grant her to me, I beseech you. If you deny me I cannot return alone; you shall triumph in the death of us both." As he sang these tender strains, the very ghosts shed tears. Persephone could not resist, and Hades himself gave way. Eurydice was called. She came from among the new-arrived ghosts, limping with her wounded foot. Orpheus was permitted to take her away with him on one condition, that he should not turn around to look at her till they should have reached the upper air. Under this condition they proceeded on their way, he leading, she following, through passages dark and steep, in total silence, till they had nearly reached the outlet into the cheerful upper world, when Orpheus, in a moment of forgetfulness, to assure himself that she was still following, cast a glance behind him, when instantly she was borne away. Stretching out their arms to embrace each other, they grasped only the air! Dying now a second time, she yet cannot reproach her husband, for how can she blame his impatience to behold her? "Farewell," she said, "a last farewell," - and was hurried away, so fast that the sound hardly reached his ears. Orpheus tried to follow her again, but was refused entrance back into the Underworld. His remaining days on Earth were desolate. He held himself aloof from womankind, dwelling constantly on memories of his Eurydice. The Thracian maidens tried their best to captivate him, but he repulsed their advances. One day, excited by the rites of Dionysos, one of the maidens exclaimed, "See yonder our despiser!" and threw at him her javelin. The women, mad with rage, raised a scream and drowned the voice of the music, and then the missiles reached him and soon were stained with blood. The maniacs tore him limb from limb, and threw his head and his lyre into the river Hebrus, down which they floated, murmuring sad music, to which the shores responded a plaintive symphony. The Muses gathered up the fragments of his body and buried them at Libethra, where the nightingale is said to sing over his grave more sweetly than in any other part of Greece. His lyre was placed by Zeus among the stars. 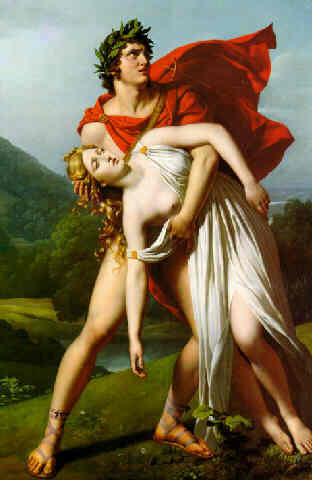 His soul passed a second time to the Underworld, where he sought out his Eurydice and embraced her with eager arms. They roam the happy fields together now, sometimes he leading, sometimes she; and Orpheus gazes as much as he will upon her, no longer incurring a penalty for a thoughtless glance. in our Famous Lovers Jigsaw Puzzles section. There are many sections to explore at BonzaSheila! See our Table Of Contents for more. Bonza Sheila: It's all about Love!